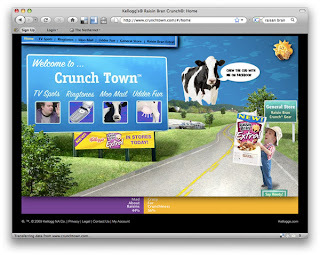 Welcome to Crunch Town. Population 1 bobblehead farmer and 1 large cow. There's an interesting thing going on at the bottom of the scene, with the purple and yellow bar. If you click you are asked to vote on whether your favorite part is the raisins or the crunch, and the bar reflects the outcome so far (purple for raisins, yellow for crunch). Each section is a different part of town, and you're stalked by the cow and the shakey head farmer. 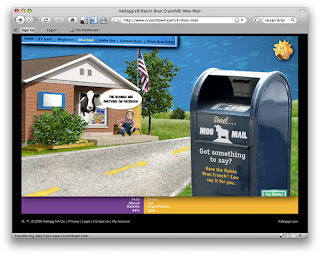 I like that in each section the cow tries to convince you to visit the herd at Facebook, and there's always a box of Raisin Bran that clicks through to the pure product page. This here is a cow-gram. 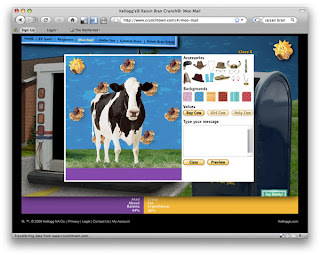 Put a hat on the cow, and type out a message to send to a friend. I typed "I'm a Party cow" in the hopes that it says the words, but it just moo's. And here is my favorite part. This game involves having the man jump onto a giant udder, and then moving the mouse rapidly up and down to jerk..i mean milk the cow. While this is cartoony and meant to be fun, i felt like I should be hidden in a bathroom stall to play it. udder fun i suppose. Now that I think about it, I don't see the connection between the cow, farmer and Raisin Bran. Cows don't make Raisins do they?